This entry was posted in 2000s, Dramas and tagged adam baldwin, browncoats, Firefly, gina torres, joss whedon, nathan fillion, sci-fi, science fiction, serenity, space cowboy, whedonverse by meekthegeek. Bookmark the permalink. I really hate to be pedantic. This is a great post, and I completely agree with you… But Adam Baldwin’s character is Jayne Cobb… there’s a y in there. Other than that it’s a great post that captures the essence of the pilot very well… and without giving away too much plot. Hey there, how’s it going? Just wondering around and bumped into a Whedonite! 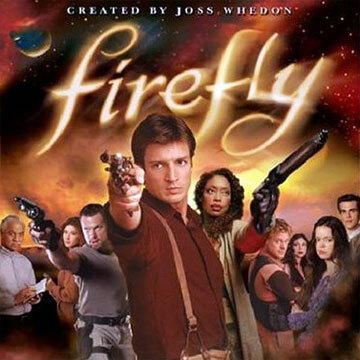 XD Firefly is stuff of legends. I hope someday Joss gets to meet opportunity and the right state of mind again to do something of that caliber again. We’ve been waiting for a while and I’m starting to thing that those start may never align quite the right way again. Still… we keep flying. Well, I’m just starting off a blog about a few things, including his work, which is something I love so much, and I’d be really glad if you’d stop by sometime. I’m still getting to know wordpress and all it has to offer, so if you’d happen to give me some tips or show me some ropes, I’d really appreciate it. Stop by if you can, hope you enjoyed it as I enjoyed it here. Thanks! i’ve already made proper post about proper things now, hehehe, but i don’t know if the frequency of posting is directly related to better trafic. i’ll take my chances tho. once again, thanks for stopping by. have a nice one. Just thought I’d mention that the episode you review is the opening episode on the DVDs but it is not the first one that was shown on television. LOL! I totally forgot that.